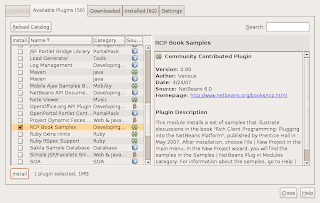 Two days ago, I was looking for Rich Client Book's samples, actually I've to find it easily on NetBeans 6.0 Update Center, but I use NetBeans 6.5.
then the sample you like to open. Enjoy the Book with the Samples. "NetBeans is the only IDE you need"